Voted ‘Britain’s Best Coastal High Street 2015’, Amble is a bustling fishing town and working port situated just 1 mile south of Warkworth Village, on the Coastal Route through Northumberland. With a good range of small, mostly independent shops, including a great little artisan bakery, excellent butchers, Italian restaurant, award-winning seafood restaurants and one of the best traditional fish and chip shops in the North East on the quayside, it’s a fascinating little fishing port. There’s a local Sunday market held every week on the old quayside, which is lovely to wander around as well as a little ‘Harbour Village’ with tiny boutique-style independent shops operating out of pods resembling old fishermens’ huts. The views from the quayside are spectacular – of the estuary, impressive Warkworth Castle, Coquet Island and of course the beautiful sea, and the walk along the harbour front to the interesting Marina is just lovely – follow it with lunch or dinner in one of the super little eateries on the quayside and you’ll truly feel a ‘sense of place’. Lying just one mile off the coast of Amble is Coquet Island, an RSPB nature reserve. It is a safe haven for over 30,000 pairs of seabirds, some of whom travel from Africa to nest there. The island is protected under European Law for birds such as the Roseate Tern, one of our rarest nesting seabirds. Coquet Island now holds 90% of the UK’s Roseate Tern population. Coquet Island has been a place of sanctuary since St. Cuthbert, an early Northumbrian saint who landed there in AD684. The Duke of Northumberland owns the island including its unusual square-towered lighthouse, which was built in 1841. Click HERE to read more information all about Coquet Island and the boat trips you can take. One of the best eating places in Amble. Customers drive for miles to visit this rustic fish restaurant to experience their fresh fish and seafood, as well as the other tasty dishes on their menu. With a huge specials board that changes almost daily depending on what the fishing boats bring into the harbour, this bustling restaurant with a stunning harbour frontage is a must to sample the catches of Northumberland. Booking is essential even during the week, at all times of the year. Tel: 01665 711 232, or click HERE to visit their website. A welcome addition to Amble, Sea and Soil (initially named Sea and Salt) is located at the very end of the main street of the town. Serving a variety of dishes, from typically local fish and seafood to locally reared game, this simple but beautifully styled restaurant is elegant yet informal, with friendly service and very good quality and beautifully presented food, as much as possible locally sourced. They serve breakfast, lunch, dinner, and coffee and cakes, so whatever the occasion, Sea and Soil will delight all tastes and ages. Booking is essential. Tel: 01665 713 569, or click HERE to visit their Facebook page. Owned by the local renowned chef, Martin Charlton (also owns The Old Boathouse), this informal, rustic fish shack is a seaside delight. Offering quick, fresh, local food overlooking Amble Harbour, this is well worth a visit. Opening times vary according to the season, but they are open for breakfast through to the early evening, which often extends in the summer. They’re licenced too. If you like ice cream, then you will fall in love with Spurellis. This little Italian ice cream parlour and coffee shop is a gem on Amble’s harbour road. In the summer sit outside and marvel at the harbour front, and in the winter their cosy but contemporary coffee shop serves cakes and coffee as well as their delicious ice cream. Not one to miss, they close at 5pm each day. 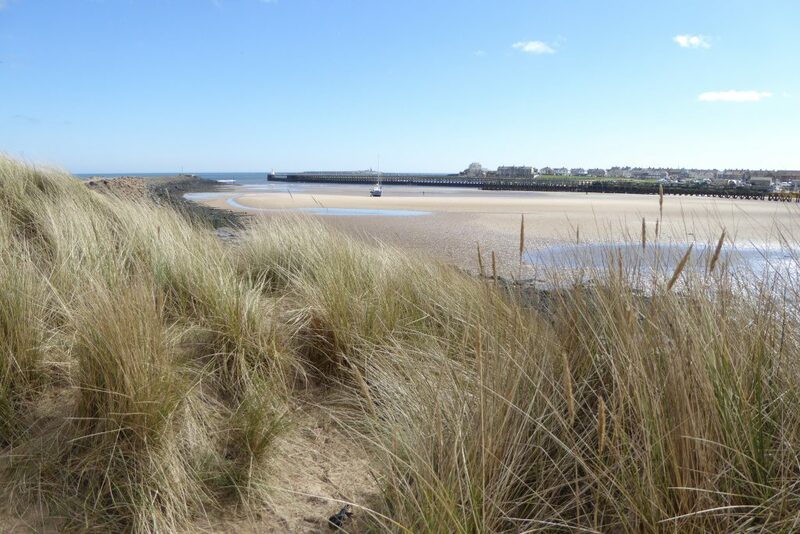 With Warkworth only a mile north up the road, stroll along the side of the beautiful Coquet Estuary and see stunning wildlife as the Coquet river turns into the sea. As well as several herons, otters can sometimes be seen and often you can see seals chasing the salmon up-river. Just bear in mind though there are no street lamps along the side of the Estuary so make sure you walk home whilst it’s still light – or bring a torch! Druridge Bay is a living landscape, rich in wildlife. The bay is a stunningly beautiful seven mile stretch of sand running from Amble down to Cresswell and is a popular place to ride, cycle, walk, paddle and surf. Today there is just the sound of the surf and seabirds, but the beach has a fascinating and varied past. Within the park you will also find a series of smaller nature reserves home to everything from a resident herd of swans to rare birds like the Golden Eye Snipe. There are some quaint shops and cafes on Amble high street, such as independent clothes retailers, hair and beauty salons and butchers, bakers and green grocers. The main supermarket is the Co-op at the top of the high street and there is a smaller Tesco at the very bottom of the high street. There are also some national chains such as The Post Office and a Boots the Chemist, as well as banks and takeaways. A new addition to Amble in early 2015 are the ‘pods’ at the Harbour Village down by the Quayside in Amble. 16 little wooden pods operate as small businesses such as a small art gallery, an old fashioned sweet shop, a bakery, gift shops, coffee shop and even 2 ‘designer’ shops for dogs! It’s worth having a wander down towards the seafront with a coffee as the Sunday Market is just at the other side of the harbour. Click HERE to visit the website for the Harbour Village. Located on the estuary road from Warkworth to Amble, Artique hosts a collection of local art stalls, vintage clothes, antiques and also has a little cafe. Worth stopping at for an ‘interesting find’. Click HERE to visit their Facebook page. The classic Amble Sunday market has been running for years. It’s a market for locals rather than tourists, but fascinating nonetheless and full of bargains! There is also a fresh fishmonger selling the day’s local catch; butchers; bakers and coffee stalls. Definitely worth a visit on a Sunday morning. If you visit in winter though, remember to wear your thermals – the north wind on the Harbour front can be chilly! On last week in May, Amble celebrates everything Puffin! A full week of fun and activities takes place at the best time of the year to see the Coquet Island Puffins as they care for their newly hatched pufflings. The festival includes guided nature walks, bird watching, local history tours, arts and crafts, water-sports and live music on an evening. There is something for all age groups held in a variety of locations throughout the town. Click HERE to visit the website for the event. Amble was originally located well to the south of the mouth of the River Coquet, however in March 1764, the river below Warkworth changed its course due to heavy rain. This event changed the fortunes of Amble. Today Amble lies at the mouth of the River Coquet on the North Sea coast in mid-Northumberland. It is located nine miles south of Alnwick and a mile southeast of Warkworth. The town was built on a peninsula, providing extensive views of the surrounding coastline. For a short time in the 1980’s Amble was officially known as Amble-by-the-Sea, however this was dropped in 1985 and the town reverted back to being called Amble. Amble also holds the title ‘Friendliest Port’. It is believed that this comes from the 1930s when the RMS Mauretania was heading on her last voyage to the breaker’s yard at Rosyth in Scotland. Amble Town Council (Amble Urban District Council) sent a telegram to the ship saying “still the finest ship on the seas” and the Mauretania replied with greetings “to the last and friendliest port in England”. The Wellwood Arms pub is one of the oldest buildings in Amble and was originally a farmhouse for Link House Farm – one of the three farms, which made up early Amble (when the population was a mere 152). The 1842 Tithe records for Amble shows that Link House Farm and surrounding land was owned by a Mrs Maria Wellwood – which may be one explanation for the name The Wellwood Arms. Today, Amble is Northumberland’s most important fishing centre north of the River Tyne. The fishing industry survives, although with reduced numbers of vessels, as does a small marine industry – mainly concentrated around the construction and repair of yachts and other pleasure craft. Leisure sailing has also become important and, as well as the marina, the town has a vibrant yacht and boat club. The outer boundary of the marina incorporates one of the original timber jetties from the early harbour as part of the old river bed was reclaimed during construction. A small industrial estate is located to the southwest of the town, whose clients include interior designers, vehicle repairs and telecommunications companies. Amble also has a number of good shops including Tesco and Boots, gift shops, and many restaurants, pubs and fast food outlets. Tourism now forms an important sector of Amble’s economy and the town has much to offer the day visitor particularly, although there are also several caravan parks, guest houses, B&B’ and self catering cottages catering for the numerous visitors to the Northumberland coast. Amble also offers walks along the River Coquet to Warkworth and south past the harbour and Little Shore, following the coastline to Hauxley with views of Coquet Island. There are nature reserves at Hauxley and Druridge Bay. The Braid is a popular open space adjacent to the marina and nearby Druridge Country Park has a lake, visitor centre, picnic areas and access to a huge yet quiet sandy beach. Still not quite sure where to start? We know Northumberland all of our cottages inside out, so if you have any particular queries, please don’t hesitate to call or email us. We’re more than happy to help!